For most of my life the extent of my cabbage eating came in the form of Chinese egg rolls and deli style mayo drenched cole slaw, oh man was I missing out! Several years back I started experimenting with Asian style cabbage slaws and even cabbage filled pot stickers, but still it took me a while longer before I discovered a comforting, mildly sweet and delicious bowl of cooked cabbage and I haven’t looked back since. I actually owned my copy of Heidi Swanson’s fantastic (the name alone is cool enough!) “Super Natural Every Day” for about a year before I finally tried her recipe for White Beans & Cabbage with parmesan, potatoes and cabbage. The crazy thing is, the cover photo for the book is exactly that and it looks unbelievably delicious, I stared at that cover for a year thinking “yum” “must try”, but every time I decided this would be the day something got in the way, sometimes I had cabbage but no potatoes on hand, other days I had all the ingredients but got lazy and opted for a more familiar option to cook for dinner. But finally one day, the planets aligned and I finally made it and oh was it gooood. 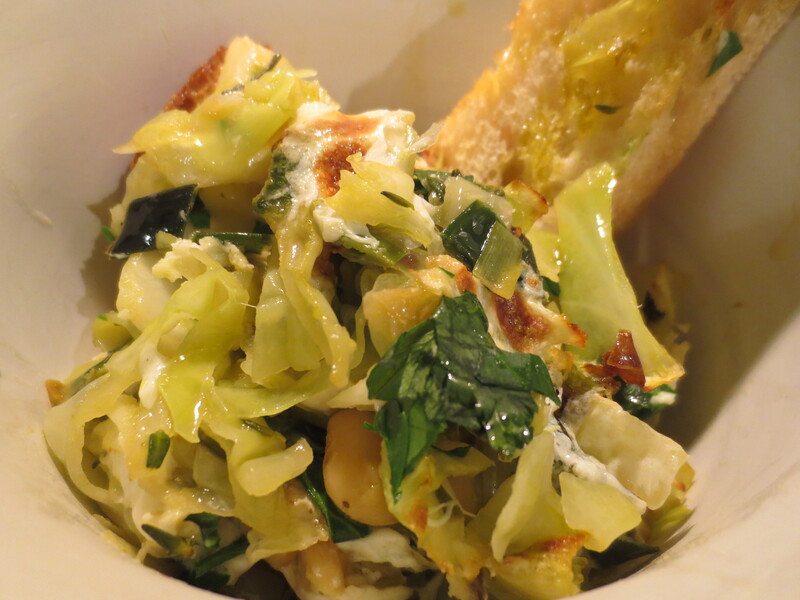 The cabbage cooks up soft and mildly sweet, but still maintains a little texture, the beans are creamy and the potatoes nice and crisp, top with some melty mozzarella and served with a hunk of crispy toasted baguette drizzled with a little olive oil and you have a perfect bowl of comfort food, yum. I adapted this from the Barefoot Contessa’s recipe for Spanikopita, I made quite a lot of changes; adding ricotta cheese, changing the herbs, swapping her scallions for leeks, eliminating bread crumbs and of course using a LOT less butter and olive oil, until it no longer seemed as much a spanikopita as it seemed sort of spanikopita, sort of not, so it became Spanikopasorta. Unlike a traditional spanikopita which is layered and baked as more of a casserole, this is rolled up roulade or struedel style. I like this served with either a green salad or tomato salad, either way great for lunch or dinner served hot or at room temperature. This would also make a great party appetizer or hors d’oeuvres. Heat Olive Oil and Butter in a large non stick sauté pan. Add the chopped Leeks, cook for a few minutes and then add in the chopped Garlic. 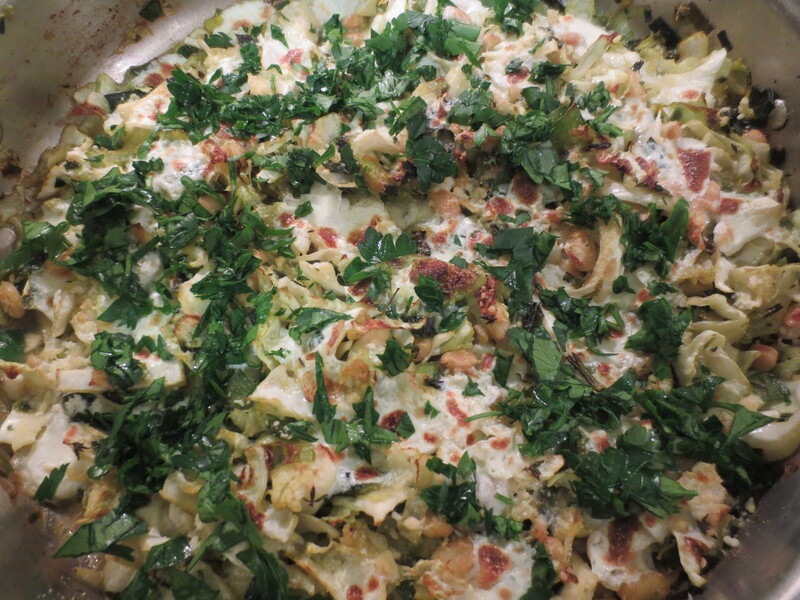 Continue cooking until the Leeks are softened and browned a bit on the edges, but not completely. 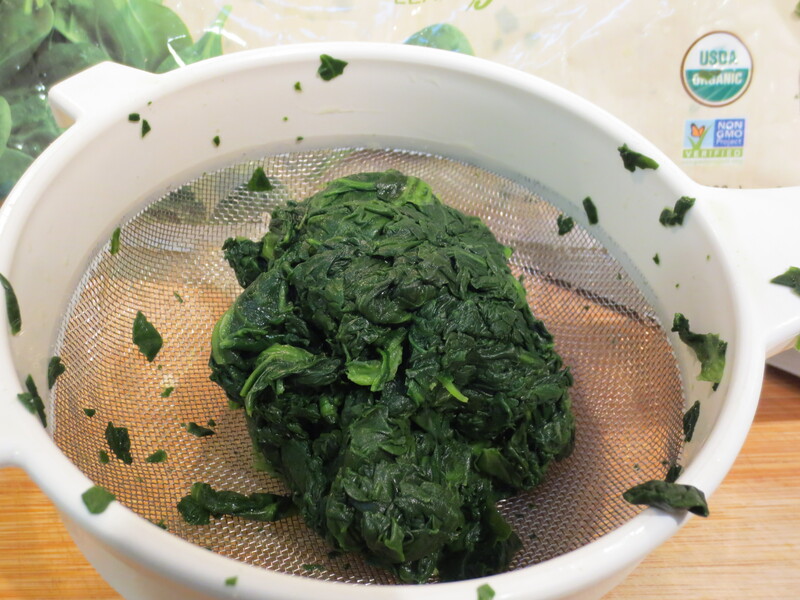 Meanwhile, squeeze out the water from the Spinach. 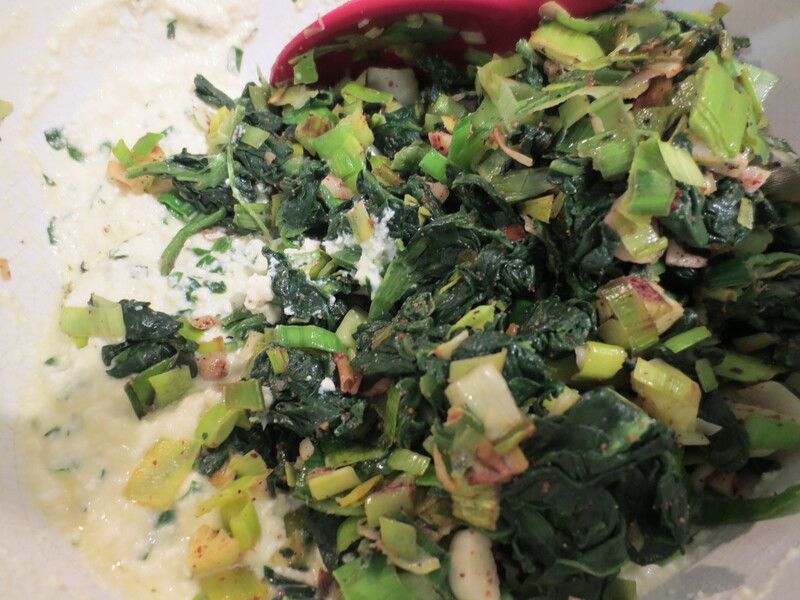 Turn off the heat and add the Spinach to the pan with the Leeks and Garlic and toss around a bit. 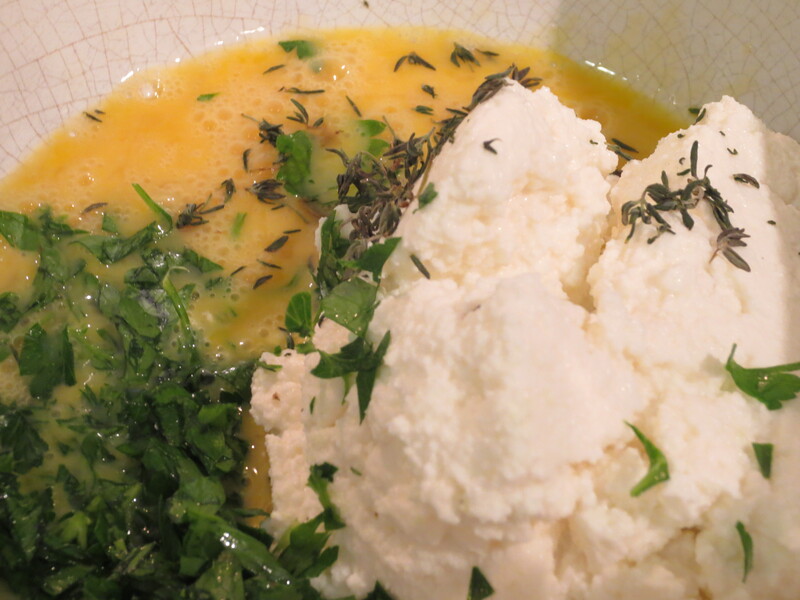 In a medium to large bowl, add the Ricotta, chopped Parsley, Eggs, crumbled Feta cheese, Nutmeg, Thyme leaves, Salt and Pepper. Stir to combine and then add in the slightly cooled Spinach, Leeks and Garlic, stir again. 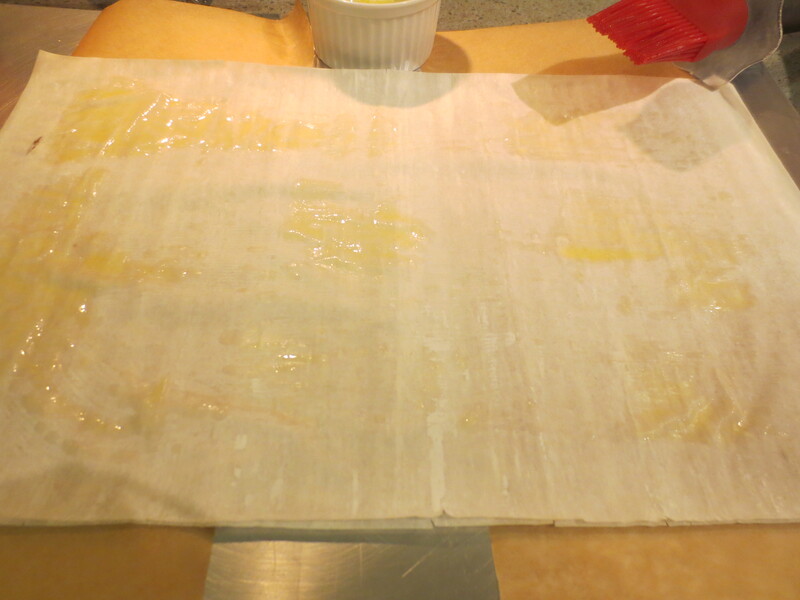 Lay out 2 sheets of Phyllo and brush all over with a little bit of melted Butter, then continue layering 2 sheets at a time with butter brushed in between until you have used 10 sheets. 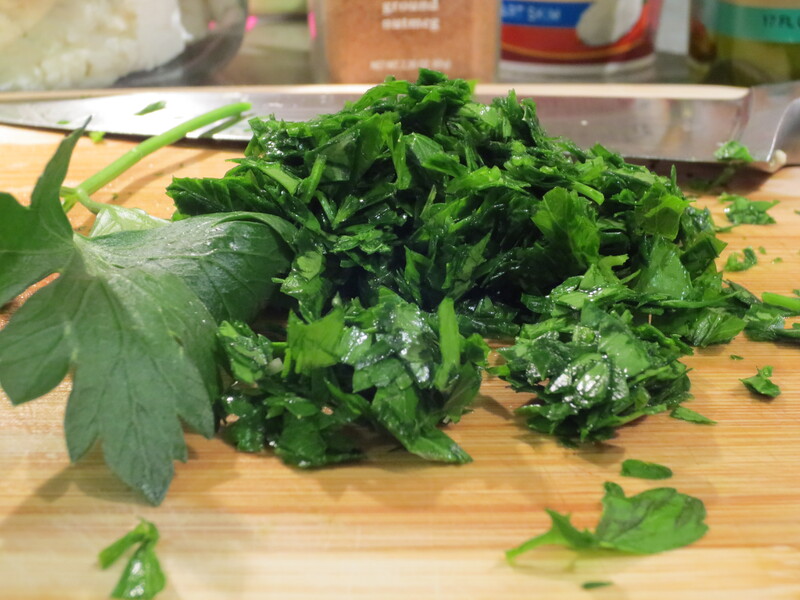 To make Struedel style – Spoon either 1/3 or 1/2 of the Spinach & Cheese mixture down the center of the Phyllo stack, leaving about 1 inch at each short end without filling. Fold over the two sides and then wrap one long end over the filling and finish by folding the last end over the top and brush with a little more butter to seal. Carefully move struedel to a baking sheet. 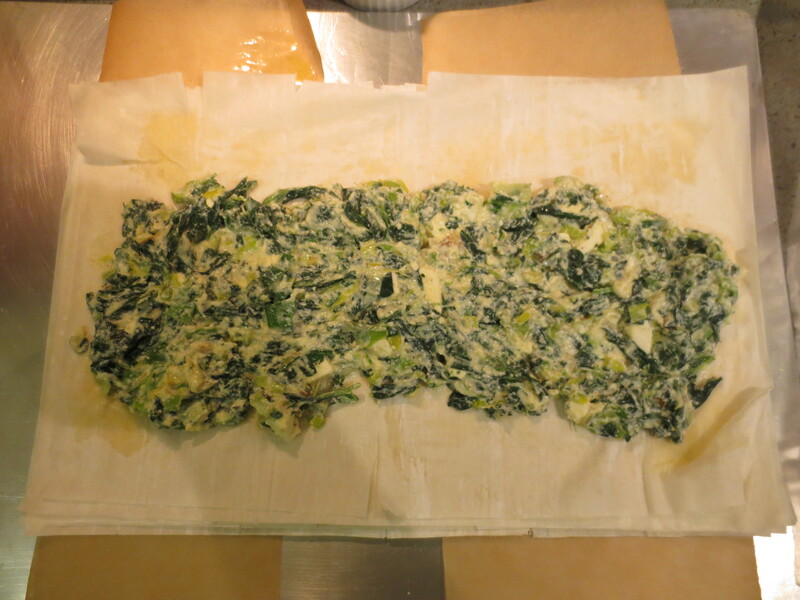 To make Roulade style – Spoon either 1/3 or 1/2 of the Spinach & Cheese mixture to cover the whole sheet of Phyllo, leaving a border about 1 inch around. Next fold over the short ends and then begin rolling the Phyllo over the filling, finishing with a little brush of melted Butter. Carefully move to a baking sheet. 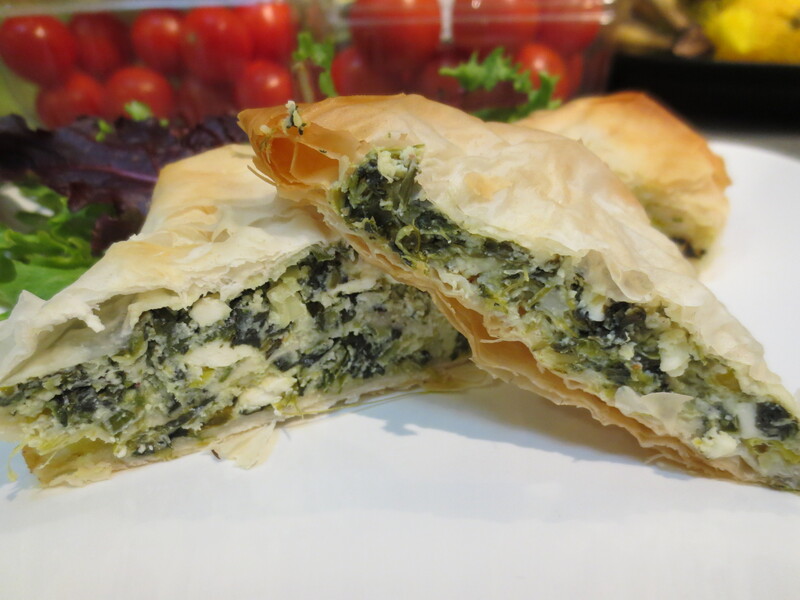 Repeat with remaining Phyllo and filling until you have 2 or 3 roulades or struedels. Whether you end up with 2 or 3 is merely a matter of personal preference, depending on your preferred ratio of filling to pastry. Bake at 400 degrees F for about 20 minutes. Divide each struedel into slices 1-2 inches thick or larger pieces if you prefer. Serve hot or at room temperature. Enjoy! 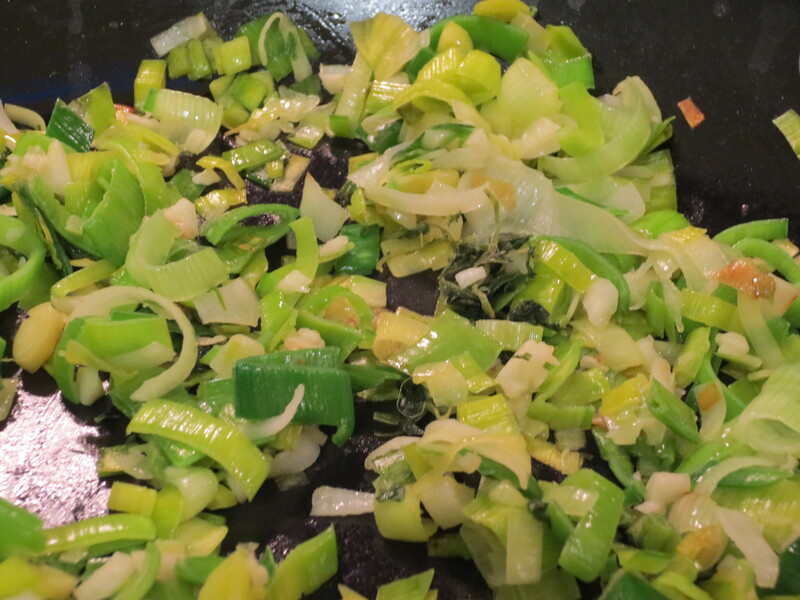 Leeks – most recipes instruct to use just the white and light green parts of the leek, but I really prefer to use almost the whole leek including the darker green. 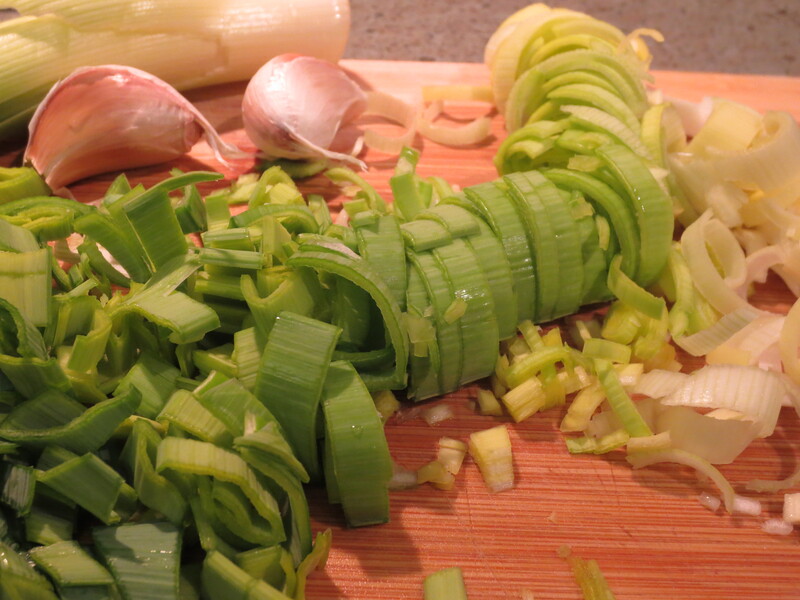 I slice through most of the leek and as I get toward the dark green less tender end, I peel away the outer layers and then continue to slice through the more tender inner layers. 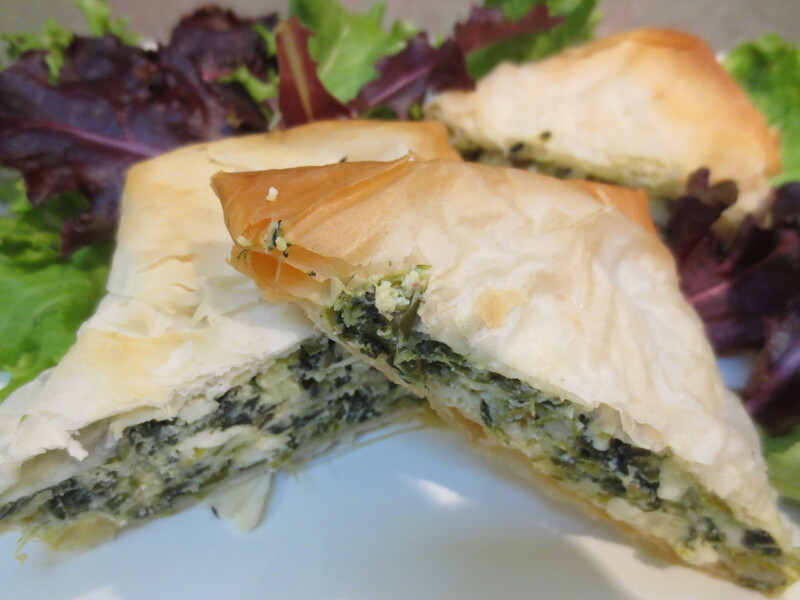 Phyllo dough is sold frozen, not be confused with puff pastry. Phyllo is thin and papery. It tends to dry out quickly, so I just unroll as many sheets as I need for the moment, leaving the rest wrapped until needed.